Social Media = Social Murderer? You're here » Home » Social Media Marketing » Social Media = Social Murderer? For everyone out there who is currently bemoaning the death of social interaction at the hands of services like Facebook and Twitter, a new study released today by ExactTarget and CoTweet will ease your mind. According to this report, these social networking behemoths are not having a negative effect on face-to-face relations. Titled “Social Mythbusting,” the report is the seventh in the “Subscribers, Fans and Followers” research series from e-mail marketing provider ExactTarget and its social media management tool, CoTweet. 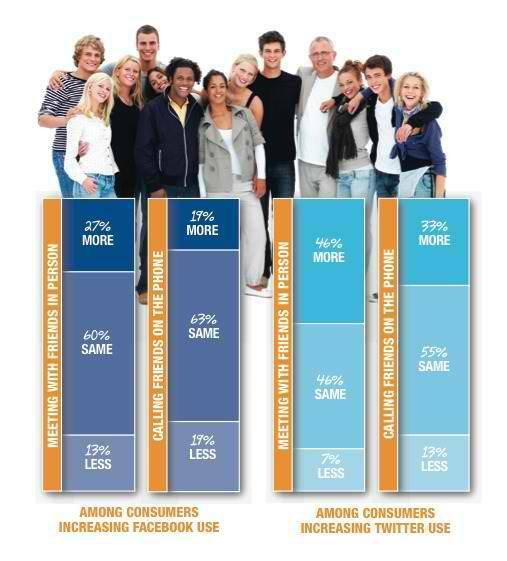 The study was conducted in two phases: 1) A series of focus groups containing 44 people that centered around the reasons consumers cite for engaging with companies via e-mail, Facebook and Twitter — as well as the plusses and minuses of those tools and 2) A survey taken by 1,506 U.S. citizens (aged 15 and older) that played off of themes addressed during the focus groups. This research revealed that despite concerns that social media is killing relations with our fellow man/woman, among people who report that they’re using Facebook more, 27% say they hang with friends in person more often as well. Thirteen percent say the opposite — that their face-to-face time has decreased. The report also found that among those who are using Twitter more and more, 46% say that they’re meeting up with friends more often, with 7% reporting declining personal time. Still, that leaves 60% of burgeoning Facebook users saying that Facebook has no effect on how often they meet up with friends, and 46% of Twitter users reporting the same. What do you think? Are Facebook, Twitter and the like making you more social? Headline: Social Media = Social Murderer?